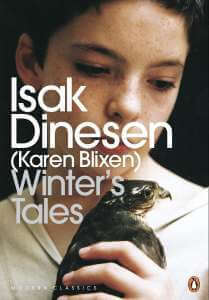 Winter’s Tales is a collection of eleven short stories, wrote in the ‘30ies and published in 1942. The pieces contain several recurring themes that go through the whole narrative structure in wave motion, intertwining as sets and subsets yet never resolving in a true unity: sea voyage, art, feminine heroism, childhood, are some of the motifs that frequently recur in the stories, although not representing a valid pivot for the collection. If one cannot capture the overall features of the plots of the stories, the same can be said about the substantive message: if dissatisfaction prevails in some stories, acceptance of the world transpires in others; if tension in some stories is resolved, the lack of existential balance is present in others. And not even the style can somehow help us: some stories are written with romantic tones, while others are definitely fabled. If we wanted to find a common element at all costs, we could strive to notice that in all of the stories it is the sense of longing to prevail, and above all, the reactions that each character has in this longing; but this feeling is gradually contaminated by the rest of the story, by its particular settings and sensations, that it becomes elusive and almost invisible. Unfortunately, Blixen’s narrative research does not find a logical thread, and the criterion of a collection of such different stories is not clear. If this sense of disorder has the advantage not to bore the reader, it has though the disadvantage to make this collection almost evanescent: the stories hit but do not dig, they fascinate but do not enchant. Yet individually, they are small narrative jewels: Blixen is an almost mystical storyteller, which tells magical fairy tales and almost gothic stories, which traces bourgeois portraits accurately set in structures of philosophical reflection; and she has the ability to tell dark and grim stories, yet innocent at the same time. As the best storytellers, Blixen plunges us into worlds very different from each other, she cradles us with the magical effect of words, thrilling us before these short, impressionistic works. Among the various reflections, stillness emerges: not an anxious or depressed one, but calm and serene, shiny and static as the Flemish paintings of the 17th century. The research of harmony must not be made in the ‘far away’, but rather in the starting condition: it is from our world that we have to discover life, looking for new realities but still within ours. The little signals that occur when we are about to leave make us understand that we must stay, as all this takes place without frustration. Our world leads us to a balance of joy and pain, to an equilibrium of balances that only together can bring us closer to perfection. Moreover, the world must be experiencesd without being influenced by one’s knowledge, which is not enough in itself, but rather through the focus on small things, since it is in them that we find the true essence of life. And this does not follow Pascoly’s ‘poetics of the child’ that rejoices simplicity with equally simple eyes: on the contrary, one can rejoices simplicity only acquiring the necessary wisdom, through a strenuous intellectual journey that can be accessed not through naivety, but through deep thoughts. Next to this message, we find the equally recurring figure of the outsider (sometimes underlined by the disguise), who cannot perfectly adapt to their world he belongs to. So, while on the one hand it is recognized that serenity lies in our world, on the other hand there are figures that, although often incapable of big revolutions, still feel a shiver of escape, often nipped in the bud. The realization of Blixen’s analysis stems from the attention to the anthropological constant, and not to the historical variation, and it is perhaps for this reason that she tells about different times, different social classes and different places (although the Danish landscape is almost always the background of the events, tinted with nostalgic colors and evoked also in other places): safety comes from knowing that the world will always be deeply the same, even if it will superficially change. The reflection of one of the characters (Adam in Sorrow-Acre) can help to find an interpretation: “He saw the ways of life […] as a twined and tangled design, complicated and mazy; it was not given him or any mortal to command or control it. Life and death, happiness and woe, the past and the present, were interlaced within the pattern. […] And out of the contrasting elements concord arose”. However, it must be kept in mind that many are the reading keys in Winter’s Tales, often overlapping, and depending on the perspective that we take into consideration, the emphasis on a particular aspect of the human condition can alter the perception of the entire meaning. A curiosity: in the tale The Pearls, the great Norwegian write Ibsen appears, exchanging a few words with the main character. Christentze Karen Dinesen was born in 1885 in Rungstedlund, near the town of Hørsholm, in northern Denmark. Better known as Karen Blixen, she also used other pseudonyms, including Isak Dinesen, Osceola and Pierre Andrézel. In 1913, she left for Africa with her boyfriend, whom she married, but from whom she divorced after only seven years. For economic reasons, she was forced to return to Denmark in 1931, but for six years she continued to think longingly of her experience: this took her to publish in 1937 the novel that made her famous, Out of Africa, whose success where increased by the famous and award-winning film adaptation. But syphilis, that she had contracted from her husband, consumed her body more and more, and she died in Copenhagen in 1962, after a long agony, in which she could not even feed herself anymore.